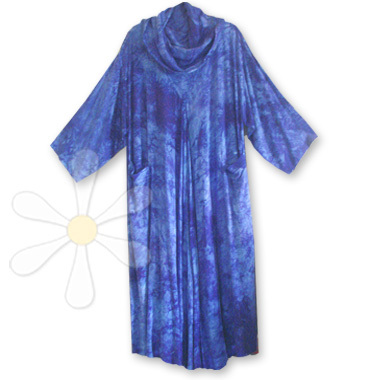 As modest as it is bold, this generous flowy caftan dress will coddle you in MILES of scrumptious sousdi! Roomy on almost any figure, it has a languid draped collar that tops a flattering V-seamed neckline, and inverted V-shaped gussets in the center front (and back) that bring the hemline to a fabulous 200" circumference! The finishing touch are the deep pockets with trapunto tabs. Snuggly susti in global style... at its best!